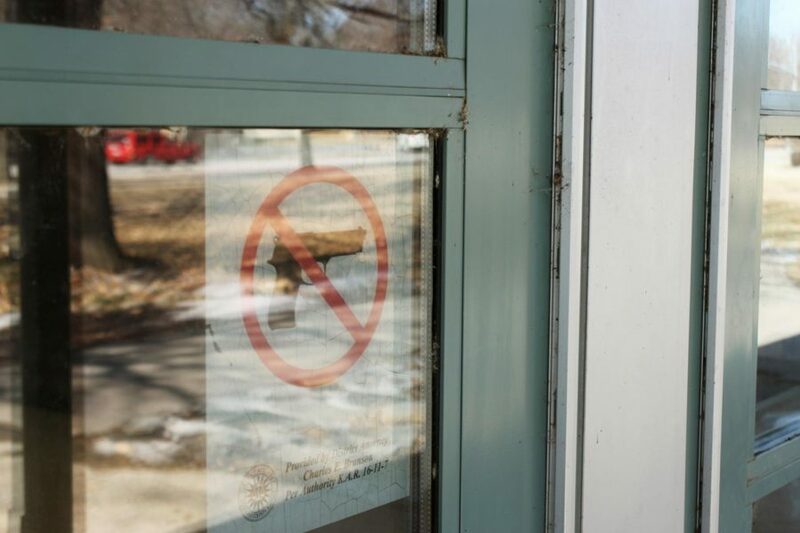 An outside entrance to Lawrence High School notes that guns are not allowed inside the building. I never thought I would need to spread word to students that it is important to leave your guns at home. But in the past week, two students brought firearms to Lawrence High School. This should be a gun free zone — and not just because the law says so. But also because too many things can go wrong. We are a student body made up of 1,600 teenagers walking around, and there is immaturity and impulsivity lurking in every corner. The root of the problem here seems to be either ignorance to or disregard for the schools safety policies since the district has emphasized that there were no threats. However, it is clear to me that many students have no idea how to handle a situation when they learn a student could be putting other students and faculty in danger. If you know someone is carrying a weapon, no matter who it may be, you need to tell faculty or an SRO as soon as possible. They are here for your education and protection. There is no student that is excused from the gun free zone policy, and you can’t cross your fingers and hope they aren’t a threat. If you are unsure what the best way to tell faculty about a situation like this is, you aren’t alone. Pull a teacher or SRO aside where other students can’t hear and tell them exactly what the concern is. Doing this will avoid panic. Feeling open to talking to an administrator, faculty member or SRO is not just limited to when a firearm is involved. If you hear something sketchy or have a bad feeling about something, tell someone. It does more good than you may think. We deserve to be in a safe school and should be thankful to the students who spoke up this week.